I picked up a pound of pre-packed, 1/4-inch thick pork cutlets at Trader Joe’s and a container of shiitake mushrooms. I had asparagus in my fridge, sweet bell peppers that had seen better days and voila: faster than take-out, less expensive, much less fat and twice as good. 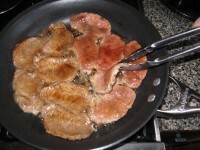 Chicken breast or thigh strips, or sliced beef could be substituted for the pork, as well. I served this with white basmati rice; rice noodles would be perfect, as well. Whisk together soy sauce and rice wine vinegar on a large platter. Let cutlets sit in marinade while you prep the remaining ingredients, turning oncee to coat both sides. Heat oil to medium-high heat and cook cutlets 2-3 minutes per side until just cooked through. Remove and reserve. 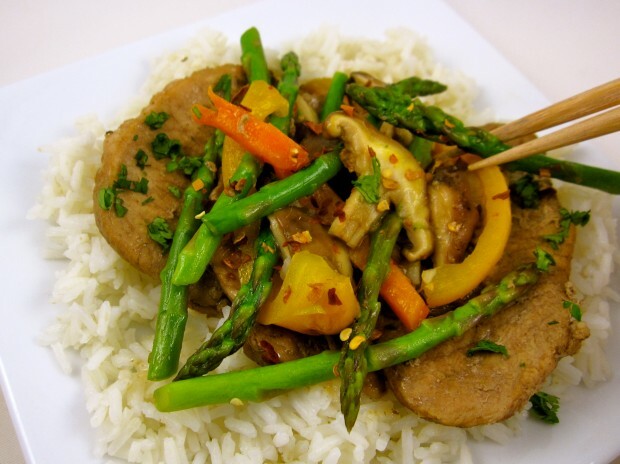 In same pan, raise heat to high then stir fry shiitakes, asparagus tips, peppers, garlic and ginger 2-3 minutes, stirring, or until crisp tender.Reduce heat to simmer, return cutlets to pan to reheat and serve vegetables over cutlets garnished with cilantro and red pepper flakes, if using.